This set of Embedded Systems Problems focuses on “Segmentation and Paging”. Explanation: The dirty bit is said to be set if the processor modifies its memory. This bit indicates that the associative set of blocks regarding the memory is modified and has not yet saved to the storage. 2. Which of the following have an 8 KB page? Explanation: DEC Alpha divides its memory into 8KB pages whereas VAX is a small page which is only 512 bytes in size. PowerPC pages are normally 4 KB and ARM is having 4 KB and 64 KB pages. 3. Which of the following address is seen by the memory unit? Explanation: The logical address is the address generated by the CPU. It is also known as virtual address. The physical address is the address which is seen by the memory unit. 4. Which of the following modes offers segmentation in the memory? Explanation: The main memory can split into small blocks by the method of paging and segmentation and these mechanisms are possible only in protected mode. 5. Which of the following is necessary for the address translation in the protected mode? Explanation: The address translation from the logical address to physical address partitions the main memory into different blocks which is called segmentation. Each of these blocks have a descriptor which possesses a descriptor table. So the size of every block is very important for the descriptor. 6. What does “G” in the descriptor entry describe? Explanation: The granularity bit controls the resolution of the segmented memory. When it is set to logic one, the resolution is 4 KB. When the granularity bit is set to logic zero, the resolution is 1 byte. 7. How many types of tables are used by the processor in the protected mode? Explanation: There are two types of descriptor table used by the processor in the protected mode which are GDT and LDT, that is global descriptor table and local descriptor table respectively. 8. What does the table indicator indicate when it is set to one? Explanation: The table indicator is a part of selector that selects which table is to be used. If the table indicator is set to logic one, the will use the local descriptor table and if the table indicator is set to logic zero, it will use the global descriptor table. 9. What does GDTR stand for? Explanation: The global descriptor table register is a special register which have the linear address and the size of its own GDT. Both the global descriptor table register and local descriptor table register are located in the global descriptor table. 10. What does PMMU stands for? Explanation: The paged memory management unit is used to decrease the amount of storage needed in the page tables, that is, a multi-level tree structure is used. MC68030, PowerPC, ARM 920 uses a paged memory management unit. 11. Which of the following support virtual memory? Explanation: The paging mechanism supports the virtual memory. Paging helps in creating virtual address space which has a major role in memory management. 12. What does DPL in the descriptor describes? Explanation: The descriptor privilege level is used to restrict access to the segment which helps in protection mechanism. It acquires two bit of the descriptor. 13. What does “S” bit describe in a descriptor? Explanation: The S bit determines whether it is a system segment or a normal segment. When the S bit is set, it might be a code segment or a data segment. If the S bit clears, it is a system segment. 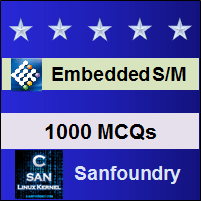 To practice all areas of Embedded Systems Problems, here is complete set of 1000+ Multiple Choice Questions and Answers.